Discount available! 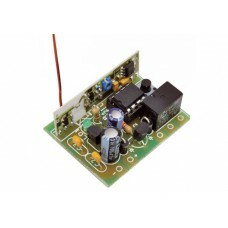 Recommend Micro 1 Channel Receiver 433 MHz to your friends and get your Discount. Here we present a small, low cost single channel receiver, encoding MM53200 and HT-12, with code self-learning function. Decoding is achieved by means of a PIC microcontroller by Microchip, that deals even to the memorization of 5 codes and governs the relay output as well. - Absorption: 40 mA max.